The vapor pressure sensor and the vsv for the canister closed valve (ccv) are used to detect abnormalities in the evaporative emission control system. 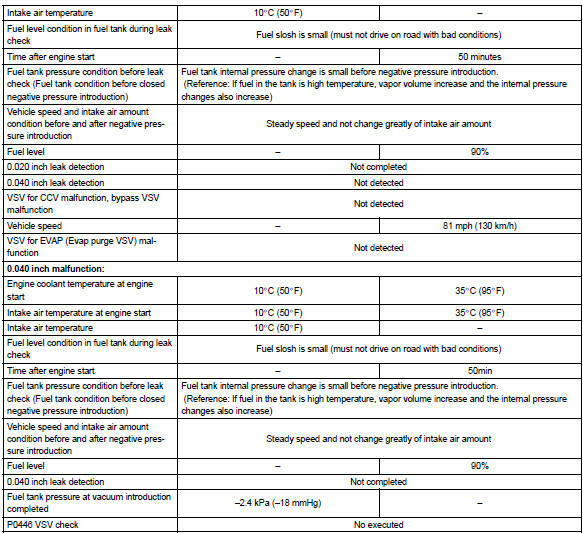 The ecm decides whether there is an abnormality in the evaporative emission control system based on the vapor pressure sensor signal. 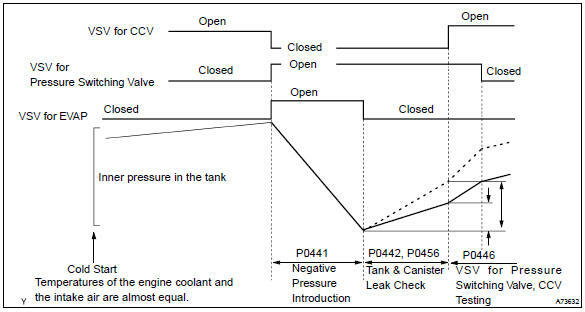 Dtc p0442 or p0456 is recorded by the ecm when evaporative emissions leak from the components within the dotted line in fig. 1 Below, or when the vapor pressure sensor malfunctions. : typical dtc output of each trouble part. *1: Ecm may output some other dtcs combination. The evaporative emission system consists of the vapor pressure sensor, the canister close valve (ccv), the vsv for pressure switching valve and the vsv for evap (purge vsv), those are used to detect malfunction in the system by ecm. 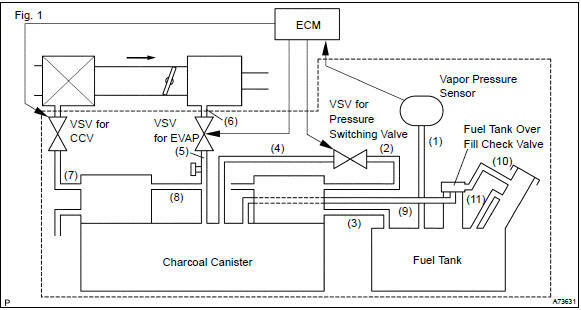 This test will run once per driving cycle when the ecm detects stable vapor pressure in the fuel tank. While the vehicle is being driven on rough or winding roads, the movement of the fuel in the tank will cause unstable fuel tank vapor pressures and the diagnostic test will not executed. the fuel tank pressure stability is checked. 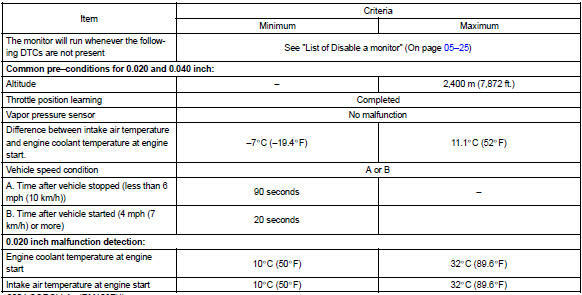 The diagnostic is disabled if the pressure change is more than specified value. the vsv for evap is opened. This introduces a negative pressure from the intake manifold to the fuel tank. the vsv for evap is closed and the negative pressure is sealed in the fuel tank. If the ecm detects either of above conditions, it will interpret this as a leak in the evap system. The ecm will illuminate the mil (2–trip detection logic) and set a dtc. Refer for detailed information on checking monitor status.